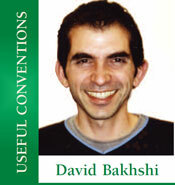 David and Heather Bakhshi are well known bridge payers, with David playing regularly for England. Together, David and Heather have done the seemingly impossible...they have children who play bridge...and not just the odd game. Liam Sanderson(16) and Jasmine Bakhshi (11) have played for the English Junior teams many times with great success. How have they done it? THIS new series aims to review and evaluate the various signalling (and discarding) methods popularly employed by club and tournament players in this country. Why is it useful to have a method of signalling to your partner? Since bridge is a game in which facial expressions or physical signals are not permitted, it is important to have a means of communicating beyond the bidding. Thus, various signalling methods have appeared over time, each with its own advantages and disadvantages. LAST time we began our series on defensive carding by looking at the Attitude signal. This month we move on to another very common form of signal – the Count signal. Why do we need an alternative to attitude signals? We concluded last time with the thought that if declarer starts the trick, then there is an assumption that our attitude will be ‘known’, so it will usually be more useful to give a different message to our partner. SO far, I have considered two common types of signal: the attitude signal, and the count signal. Let’s now move on to the third most common category, the suit preference signal. In this article, I shall discuss the basic idea and uses of suit preference signals. Further applications of this type of signal will be discussed separately. What are suit preference signals? In contrast to attitude and count signals, suit preference signals are used to give information about suits other than the one in which the signal is given. HAVING considered the three basic forms of signals – the attitude signal, the count signal and the suit-preference signal, let’s turn to the issue of discarding. This time I will focus on the methods employed by many expert partnerships, and in the next article I shall examine those preferred by many club players. Is discarding different to signalling? 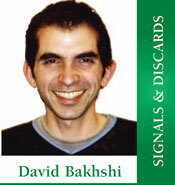 Though many people treat them differently, the choice of card that one discards constitutes a form of signal. IN this series, we will look at several conventions that have been embraced both by the expert community and also by aspiring players looking to develop their bidding accuracy. The first of these is a variation on the Blackwood convention, which utilises a bid of 4NT to ask partner how many aces he holds, to ensure that the partnership does not attempt to bid a slam when missing two aces. The traditional responses to the Blackwood 4NT enquiry are: 5♣ = 0 or 4 aces; 5♦ = 1 ace; 5♥ = 2 aces; 5♠ = 3 aces. How many times have you bid a slam that failed having found out that your partnership is only missing one ace?